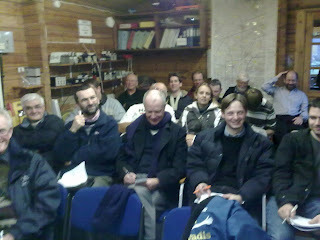 Club members were not deterred by the poor weather, a roomful turned out for Bob Smith's briefing on altimeters, pressure settings, airspace and NOTAMs. The presentation, including the photos of the local airspace boundaries, will in due course be available on the briefing room pc. After a break for lunch, Tim ran the second of his sessions to launch the new cross country mentoring scheme, this was very well attended. 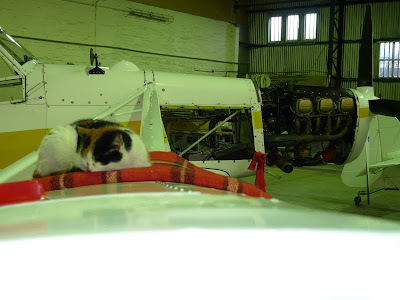 Unfortunately there were no dry spells long enough to be worth unpacking the hangar for, but Jim is suggesting that Tuesday could be worth taking the day off for. It is March after all. Booker Gliding Club is delighted to announce that, in response to popular demand, the Booker Regionals have been brought forward to run from the 29th May to the 6th June this year. “We received several suggestions that an earlier date like this would give people a chance to get their competition practice well ahead of the Nationals”, said competition Director, Paul Brice. “ This combined with the fact that we have often had some good flying conditions at this time of year made it a good choice given that it spans the spring bank holiday”. We are also lucky once more to have the services of Dr Nils Wedi, from the European Centre for Medium Range Weather Forecasting, to give us his excellent met briefings. Five first class resident tugs for a quick grid launch and an enthusiastic team of members to help it all go smoothly will all go towards making it a fun flying week. Labels: Will this man retain the trophy? A glorious warm sunny Saturday and lots of activity to report. Those who had only turned up for the briefing on ground handling found themselves out at the launch point taking flights, with the briefing taking place between flights. Simon McC helped out with a fine demonstration of splicing, a skill picked up from his sailing days. There should now be no excuse for badly parked gliders and unserviceable tow ropes. There were 30 or so flights, with some trial lessons, and John P converted to the Discus, which included learning how to rig and derig it. Cadet Ashley had a flight in the Cub to get some photos for his AS level project. Our oldest member Shep rigged his glider, and he and a number of others went out to Didcot under a massive cloud street, the rest of us soared locally. All in all an excellent day, let's hope there's more on the way. Tim Scott presented his vision of Booker's Cross Country Mentoring Scheme to a packed and enthusiastic briefing room on Sunday. The aim is to provide mentoring and support at all levels for members, helping them to achieve their goals in gliding, and have fun doing it. Whether the goal is the first tentative flight out of gliding range of the airfield or winning the world championships the pyramid structure of the scheme is designed to help everyone. The response from the group was very enthusiastic. 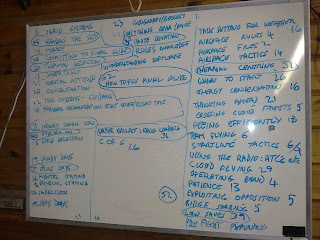 Jon Gatfield collated ideas on key developement areas affecting cross country flying. Surprisingly most of these can be worked on doing local flights in a variety of conditions. 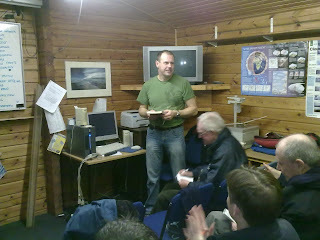 Tim will be repeating the lecture as a number of members were unable to attend this presentation. The outcome so far is the formation of a group keen to develope their own and others soaring achievements. Whilst the thermometer showed -2C the windchill effect was pronounced on the airfield because of the brisk Northerly wind. Nonetheless a few diehards towed a K-21 and K-13 to the launchpoint in anticipation of improving conditions. The conditions soon improved when solace was sought in the warm clubhouse where William Parker was hosting a session on "How To Get The Most Out Of The Day". Covering a range of topics including when and how to prepare for a cross-country flight, clues to what makes a 'good' flying day, field landings, task planning and the intricacies of badge claim (including some of the subtle points that result in a claim being rejected). Hopefully something for everybody. Suitably mentally nourished and inspired from William's presentation and physically pepped up with the hot coffee, several members ventured out to the launch point for some flying. This included tug pilot training/conversion, general training and an aerobatic sortie by Jane Moore who demonstrated some very tidily flown manoeuvres. The day was brought to a close by a speedy derig of K-21 KCZ, in preparation for it's annual check, and a return to the warmth of the Clubhouse for further gliding banter. The low cloud obligingly formed a sunny hole over Wycombe Air Park allowing Graham and Alun to run their monthly aerobatics training day, which was fully subscribed. Lots of other flying too, with best use being made of the available weather. A good time was had by all, although John P learnt the hard way that it pays to look out for the sticky-out bits when ground handling - the black eye should look impressive by Monday morning. Next Saturday the FOG briefings start - see Members page on the website or the poster in the clubhouse for details. Wind direction was good but speed near the ground strangely inadequate. 10kts at Booker and 20kts+ at 2000ft but wind sheer was such that I could not sustain at 1500ft so fled home.